It’s like something out of a dystopian novel, a crisis so unfathomable in this day and age it must be a work of fiction. Cape Town, a South African city of over 4 million, is just three months from becoming the first major metropolitan area to run out of water. As of this writing, Day Zero, the day when the city’s water supply will effectively shut down, is set for this May 11. Cape Town’s plight is a cautionary tale, littered with missed opportunities and unheeded warnings that every 21st century city and town should take to heart. As early as April 1990, the region’s Water Research Commission sounded the first alarm, as reported by the Cape Town News: “It is estimated that known fresh water supplies for the Cape Town metropolitan area will be fully committed by the year 2007.” The Commission warned that alternate sources of water would be needed should demand increase. Most of South Africa faced a severe drought in the 2000’s, and while Cape Town successfully implemented a temporary conservation program, the shortage was not taken up as a national cause, and new water sources were not implemented. Cape Town is breathtaking, flanked on one side by the Atlantic Ocean, and on the other by towering Table Mountain. It is widely regarded as one of the most beautiful cities in Africa. This led its population to increase by about 79% between 1995 and 2018, while the city’s water storage facilities grew a mere 15%. Lack of foresight is the major theme in this tale, as Cape Town failed to address the demands of its new population on multiple fronts. Following on the heels of the city’s water crisis came an electricity crisis, where demand was also exceeded supply. Faced with more people but not more power, Eskom, the city’s electric utility, resorted to “load shedding,” a series of rolling blackouts to ensure that the demand for electricity did not overwhelm the national grid’s ability to supply. Warnings about such a shortage had been raised as early as 1998, with the impending power crisis forecast to coincide with the water crisis. Water conservation methods averted the latter, but the electricity crisis hit with full force. That the predicted Eskom shortage came true should have been an additional catalyst for the City to ramp up its water production. This was not to be. It is now 2018 and Cape Town has faced below average rainfall for the last 3 years. Its water supply comes from 6 major dams: The Berg River, Steenbras Lower, Steenbras Upper, Theewaterskloof, Voëlvlei and Wemmershoek. When full, they house a total of 898,221 megaliters. As of February 2, 2018 the dams were sitting at ¼ of their total capacity. Even this amount is illusory — the last 10% of the water supply is extremely hard to extract. As a result, the City Instituted Level 6B water restrictions as of February 1, 2018. Level 6B restrictions allow a total per person water usage of 50 liters or 13 gallons per day. For context, the average shower uses 2 gallons of water per minute; washing hands and face uses about 1 gallon; shaving uses about 1 gallon; flushing the toilet uses 3 gallons. A 4-minute shower, shaving, washing and flushing is equivalent to one day’s allowable water use in Cape Town today. By comparison, the average person in the U.S. uses between 80-100 gallons of water per day. 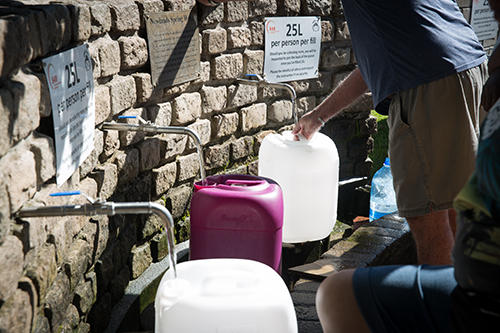 With Day Zero looming, Capetownians may have to choose between packing their bags and waiting for water, an eventuality that has gripped public attention for years – as illustrated by 290 pages of posts at the South African discussion board My Broadband. Cape Town’s solutions are nothing if not ambitious. The city is currently building three temporary desalination plants and 3 aquifer projects to help supplement the supply. Construction of the desalination plants has been interrupted by politics and local protests which have caused major delays. The Monwabisi plant, with a maximum production capability of 7 million liters of water a day, is hoped to be fully operational in May. The water to the plant must be supplied by an 800m long pipe which runs out to sea. At the 400m mark, a temporary intake valve must be installed that will allow for an initial 2 million liter per day production is slated to open in April. But the water must be pumped to a plant that is yet to be built. The potable water from the plant must then be pumped a further 400m across the road to meet up with the City water supply line, while the brine or saline wastewater is pumped back into the ocean. Construction of the Monwabisi plant has faced numerous delays because of objections raised by local community players who want members of the community to be used in construction instead of the workers brought in by Water Solutions South Africa and Proxa South Africa, the companies that were awarded a joint venture tender to build the plant. Subtech, the company that was subcontracted to build the pipeline portion of the project has been able to operate ahead of schedule despite weather delays with winds up to 50 knots halting construction at times. Yet without the plant to perform the reverse osmosis desalinization, the city will have a pipeline headed to nowhere, and its wait for much-needed water will continue. Overall, things do not look good for Cape Town. Day Zero is fast approaching. The precise date has varied from May to April and back — in any case, almost 28 years to the day that the first warnings were sounded. The predictions may seem off by 11 years, but not really. The city’s first response was temporary. Ultimately, the real warning about new sources went unheeded. The alarm that sounded for Cape Town should resonate with every 21st century community. Climate change, unpredictable weather patterns, shifting populations, unreliable supplies or unexpected contamination could replicate Cape Town anywhere. Despite decades of warnings, progress in addressing the worldwide water crisis has been limited. In the United States, communities in California, Arizona, Texas, Florida and more face an uncertain future. There are examples in cities and towns the world over. The question is, how many will heed Cape Town’s warning?